CEREMONIES THIS WEEK for the new Richard Allen postage stamp kicked off a huge year of milestones and national attention for the African Methodist Episcopal Church - and for Philadelphia's historic Mother Bethel AME Church, in particular - as the denomination marks the 200th anniversary of its 1816 founding. In July, tens of thousands of AME Church members are expected to meet in Philadelphia for the 200th anniversary of their national conference. A statue of Allen is due to be unveiled then. Six days before dignitaries and school groups gathered at Mother Bethel for Tuesday's Allen stamp ceremony, Hillary Clinton dropped in at the church to meet with black clergy members. Daily News reporter Valerie Russ spoke with Mother Bethel's 49-year-old pastor, Rev. 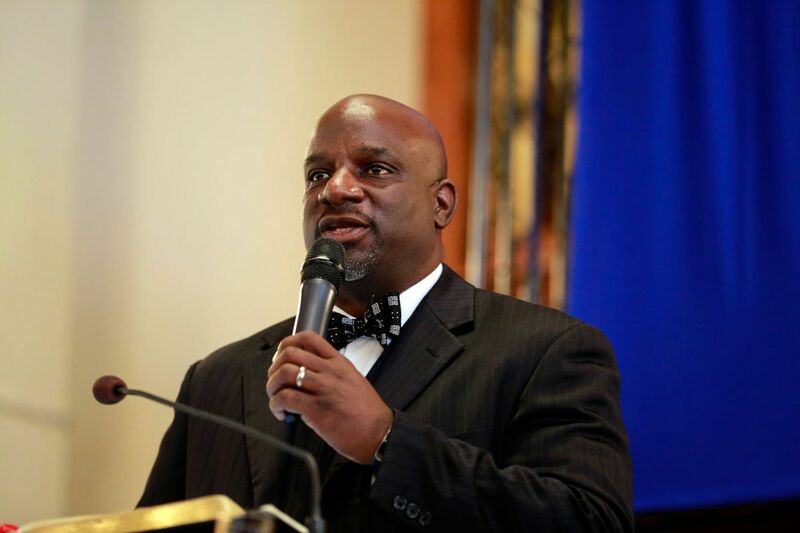 Mark Kelly Tyler, about the whirlwind of attention for the historical church, about the congregation's involvement with Black Lives Matter and the activist clergy group POWER, and about his personal status as the husband half of one of Philadelphia's power couples. Tyler grew up in Oakland, Calif. His prominent wife, Leslie Patterson-Tyler, is originally from Cincinnati. The couple moved to Philadelphia in 2003 for her job as assistant news director at Fox29. Mark Tyler became pastor of Mother Bethel in 2008. Q How is Mother Bethel preparing for all the national attention? Last year was a gut-wrenching year to be a pastor, with the killings of the nine people at Emanuel AME Church in Charleston, S.C.
Emanuel's pastor, Rev. Clementa C. Pinckney [one of those killed] was a close friend - not just a colleague. It was painful. We loved pastoring these historic mother churches with their aging buildings. So this year has a new meaning for the AME Church. It was a galvanizing event that has guided us to our 200th year with a deeper commitment to the founding goals of the AME Church. Q You've taken part in protests for Black Lives Matter, here and in Ferguson, Mo., and locally on issues around public schools and raising the minimum wage. How did you become involved with POWER? Individuals do not join POWER. Mother Bethel as a congregation is a member. Q What are the group's major concerns? We started with a listening campaign. We met with people and narrowed our focus on several issues and began to focus first on economic dignity, or the issue of jobs that pay a living wage. But soon, the School District announced it was going to close 60 schools, and that threw us into education. A couple years later, Ferguson happened, and that's how we got into [issues of] how black people are often mistreated in policing, the justice system and mass incarceration. Q Of your four childen, two are young adults, but you have two daughters in the Philadelphia public schools, in 8th and 6th grades. What have you noticed as a public school parent? It's been unbelievable to watch the cutbacks. To watch them [the schools] go from having fully served libraries, to the loss of libraries and the loss of nurses . . . It makes you weep. Q Have you worried that members of your congregation or the church leadership would be upset about your role in protests? The AME Church was born out of protest, when Richard Allen and Absalom Jones led the walkout from St. George's Church to protest inequality. The ethos and spirit of the AME Church is that if you're a pastor, you're involved in social justice work. It's part of who we are. Q Your church was host to the opening session of a conference at Temple University called "Reclaiming Our Future: The Black Radical Tradition in Our Time." Is it the role of the church to be radical? I suggested that they consider the role of the black church in the conversation. One of the speakers that night, OberyHenricks [a professor at New York Theological Seminary] said that the Jesus of the Bible wouldn't be invited to many prayer breakfasts for the powerful. The Jesus of the Bible would be concerned with the poor and the homeless. He was crucified for disturbing the status quo. Q In something of a surprise, Hillary Clinton popped into Mother Bethel Jan. 27 for a meeting with black clergy from around the country. You later endorsed her. Why? The way the meeting was billed was as a way for Secretary Clinton to hear about issues important to African Americans. I did not host with any intention of endorsing her. After listening to her, and after Channel 10 called me for an interview, I simply decided to endorse her. It was not a group endorsement. Three of my four children are girls - one is a young woman - and I want my daughters to know they can aspire to be anything. Q Your wife is the new director of media relations for the Kimmel Center. What do you make of those who call you a "power couple" in Philadelphia? My wife and I have been extremely blessed with some great opportunities. We are so extremely blessed. Philadelphia has shown us so much love. This is the longest time we've been in one city other than our hometowns.